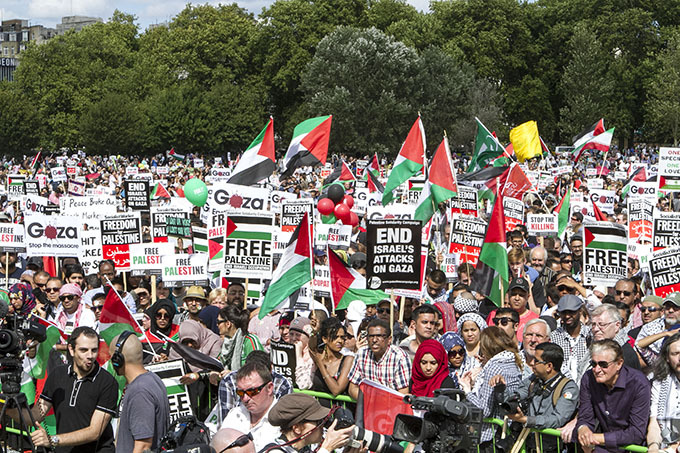 Here’s a few photos from last Saturdays large demonstration of 150,000 in support of Palestine. 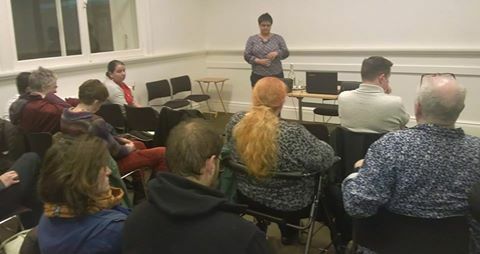 Communists met in Birmingham last night to hear Joti Brar, central committee member of the CPGB-ML, put the case for isolating zionism. 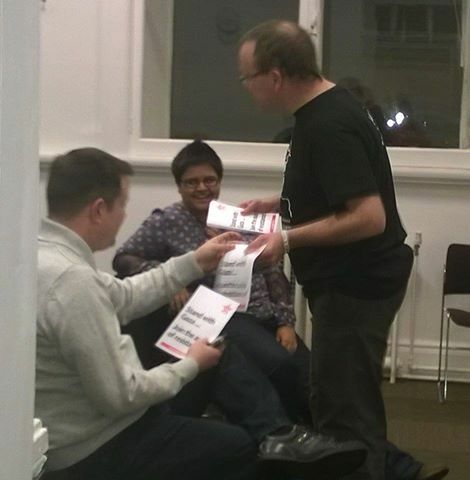 Joti explained that it is not only consumer power which can isolate Israel but the power of the organised working class. 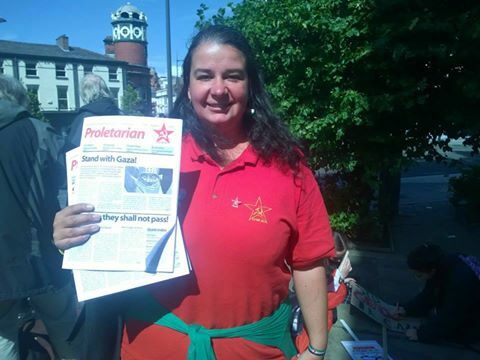 Our media unions must organise their members so as not to write, publish or broadcast war propaganda. 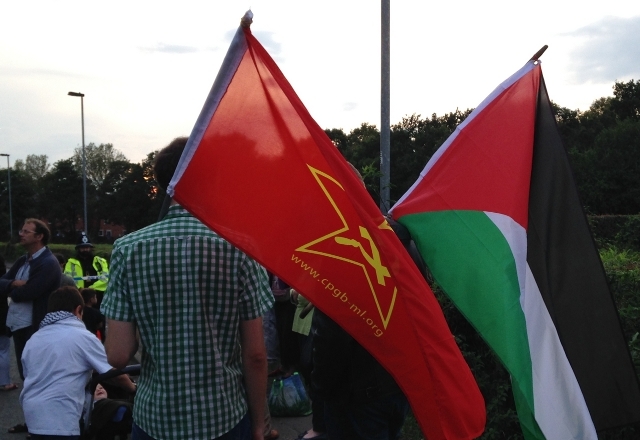 Our manufacturing unions need to organise workers to refuse to make munitions and other equipment destined for Israel and used in the ethnic cleansing of Palestinians. 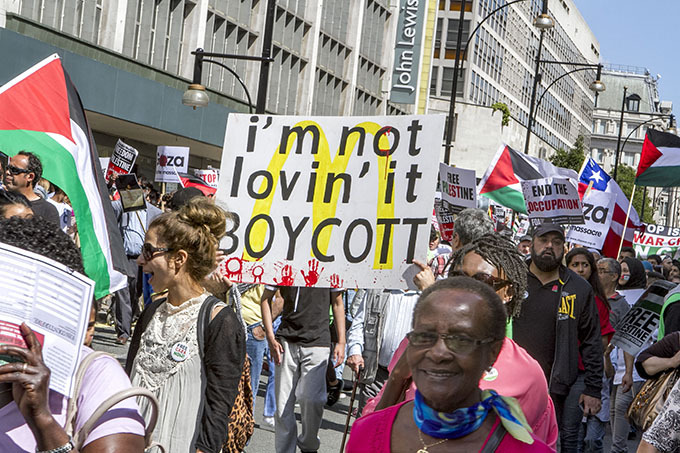 Earlier in the day red youth and members of the Birmingham committee of the CPGB-ML met and spoke to local shopkeepers about the ongoing boycotting of Israeli goods from our shops and to urge local people to support today’s demonstration in central London. Redyouth.org will post up photos from today’s demo in due course, if you can get along and help us please find our stall at Portland Place or Hyde Park! 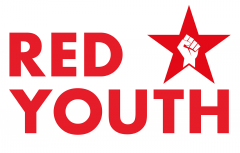 Red Youth salutes the revolutionary women of the world! Our young cadre will be publishing short pieces all this week to celebrate our revolutionary heroines in the run up to International Women’s Day. Today, Comrade Adam, aged 12, discusses Leila Khaled. In the beginning, all women had to prove that we could be equal to men in armed struggle. So we wanted to be like men – even in our appearance … I no longer think it’s necessary to prove ourselves as women by imitating men. I have learned that a woman can be a fighter, a freedom fighter, a political activist, and that she can fall in love, and be loved, she can be married, have children, be a mother … Revolution must mean life also; every aspect of life. 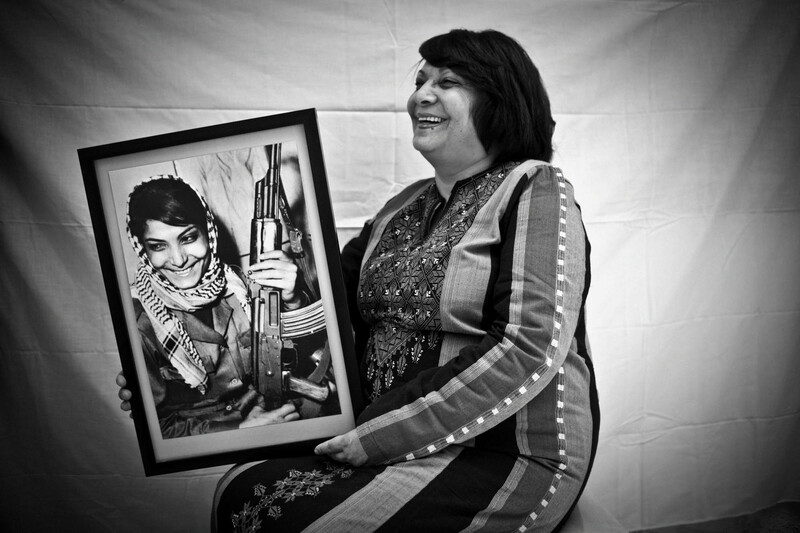 Leila Khaled is a member of the Popular Front for the Liberation of Palestine (PFLP). She was born on 9 April 1944 in Haifa, Palestine. 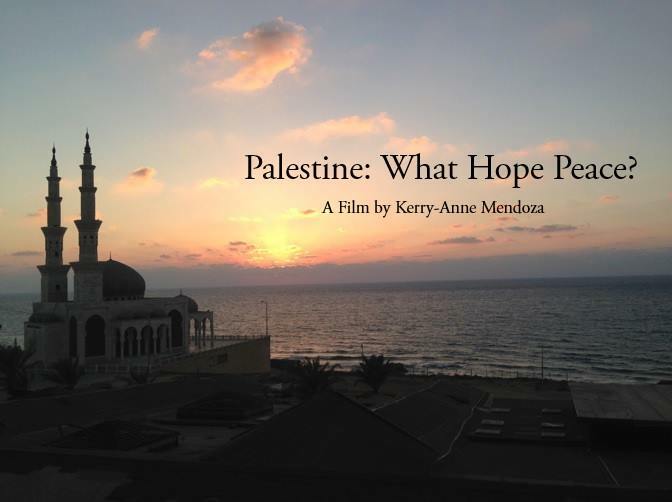 She and her family fled to Lebanon during the 1948 Nakba (Catastrophe), leaving her father behind. At the age of 15, following in the footsteps of her brother, Leila joined the radical Arab Left Nationalist Movement, originally started in the late 1940s by Comrade George Habash. 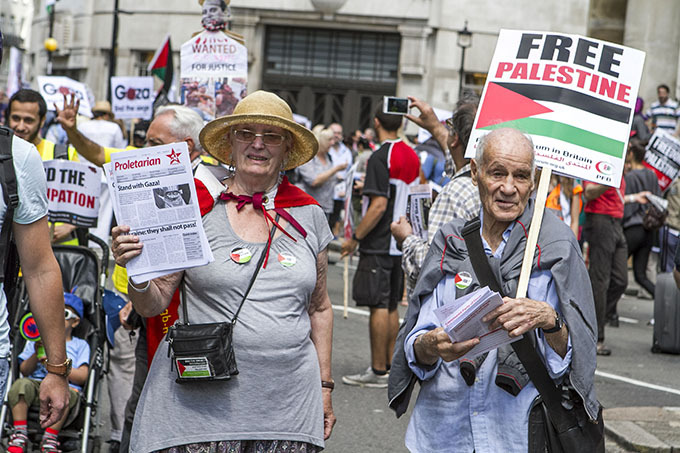 The Palestinian branch of this movement became the Popular Front for the Liberation of Palestine after the 1967 Six-Day War. 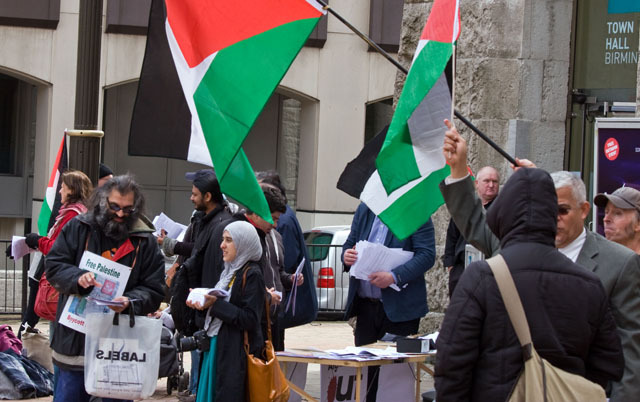 Comrade Khaled came to public attention for her role in a 1969 hijacking of the TWA Flight 840, which aimed to publicise Israel’s oppression of the Palestinians. On its way from Rome to Athens, she and her comrades diverted a plane to Damascus. She ordered the pilot to fly over Haifa, so she could see her birth place, which she could not return to. No one was injured, but the aircraft was blown up after all the hostages had disembarked. After this high-profile operation, Leila underwent six plastic surgery operations on her nose and chin to conceal her identity and allow her to take part in a future hijacking – and because she did not want to wear the face of an icon. 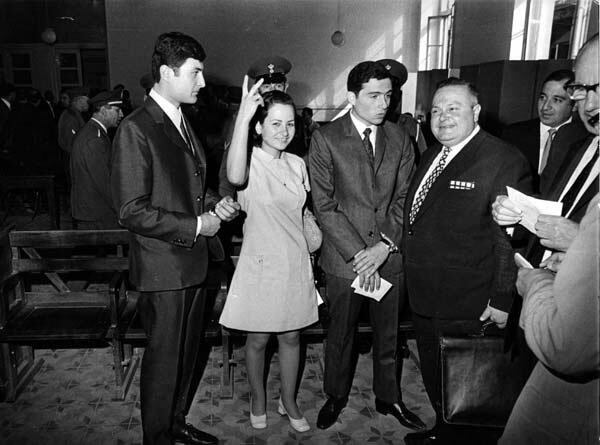 On 6 September 1970, Leila and Patrick Arguello, a Nicaraguan, attempted the hijack of Israeli El-al flight 219 from Amsterdam to New York as part of the Dawson Field hijackings – a series of almost simultaneous hijackings carried out by the PLFP. The attack was foiled when Israeli sky marshals killed Arguello and overpowered Khaled. Although she was carrying two hand grenades at the time, Khaled had received very strict instructions not to threaten passengers on the civilian flight. The pilot diverted the aircraft to Heathrow airport in London, where Leila was delivered to Ealing police station. On 1 October, the British government released her as part of a prisoner exchange. The next year, the PFLP abandoned the tactic of hijacking, although splinter movements continued to hijack airplanes. I remember each of the martyrs, one by one, and without exception – those martyrs to whom we are indebted, for whom we must continue the struggle, holding fast to the dream and holding fast to hope, and protecting the rights of the people for whom they shed their blood. Their children and their families have a right to be honoured and cared for. This is the least we can do for those blazing stars in the skies of our homeland. 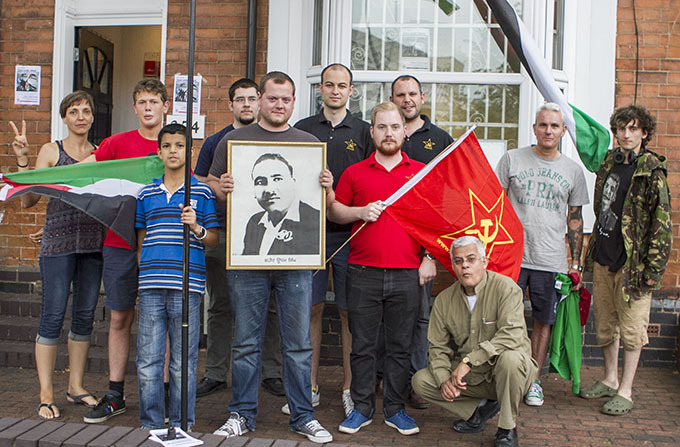 Now permit me to express my gratitude to all the comrades who have worked with me and helped me, whether in the Arab Nationalist Movement or in the Popular Front. They stood beside me during the hardest conditions and the darkest of times, and they were a great help and support for me. Without them I would not have been able to carry out my responsibilities. 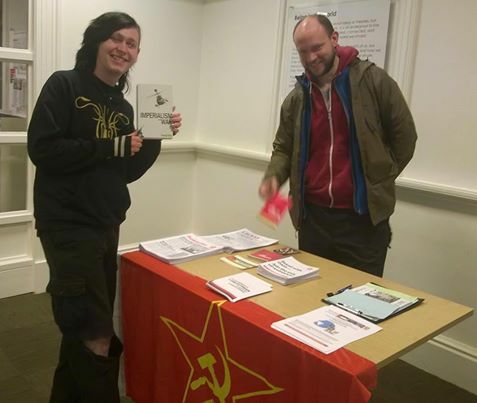 They have been true comrades, in all that the word implies. As a last word, I feel it necessary to say that I know well that the goals for which I worked and struggled have not yet been attained. And I cannot say how or when they will be attained. But on the other hand, I know in light of my study of the march of history in general, and of Arab and Palestinian history in particular, that they will be attained. In spite of this bitter truth, I leave my task as General Secretary of the Front with a contented mind and conscience. My conscience is content because I did my duty and worked with the greatest possible effort and with complete and deep sincerity. My mind is content because throughout my working years, I continually based myself on the practice of self-criticism. It is important to say also that I will pay close attention to all your observations and assessments of the course taken by the Popular Front while I was its General Secretary. I must emphasise that with the same close attention, if not with greater attention, I will follow and take to heart the observations and assessments of the Palestinian and Arab people on this course and my role in it. My aim in this closing speech has been to say to you – and not only to you, but to all the detainees, or those who experienced detention, to the families of the martyrs, to the children of the martyrs, to those who were wounded, to all who sacrificed and gave for the cause – that your sacrifice has not been in vain. The just goals and legitimate rights which they have struggled and given their lives for will be attained, sooner or later. I say again that I don’t know when, but they will be attained. 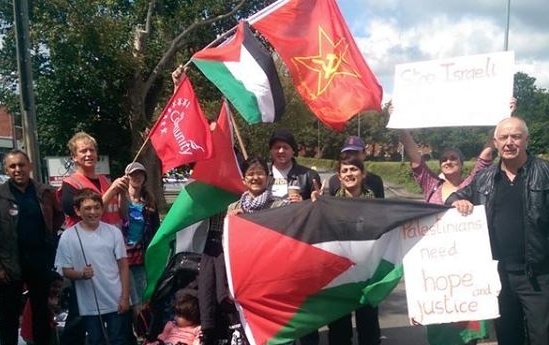 And my aim, again and again, is to emphasise the need for you to persist in the struggle to serve our people, for the good of all Palestinians and Arabs – the good that lies in a just and legitimate cause, as it does in the realisation of the good for all those who are oppressed and wronged. You must always be of calm mind, and of contented conscience, with a strong resolve and a steel will, for you have been and still are in the camp of justice and progress, the camp whose just goals will be attained and which will inevitably attain its legitimate rights. For these are the lessons of history and reality, and no right is lost as long as there is someone fighting for it. Khaled continued to return to Britain for speaking engagements until as late as 2002, although she was refused a visa by the British embassy in 2005 to address a meeting at the Féile an Phobail in Belfast, where she was invited as a speaker. She is now married to the physician Fayez Rashid Hilal, and today lives with their two sons Bader and Bashar in Gaza, Palestine, where she currently serves on the Palestinian National Council. 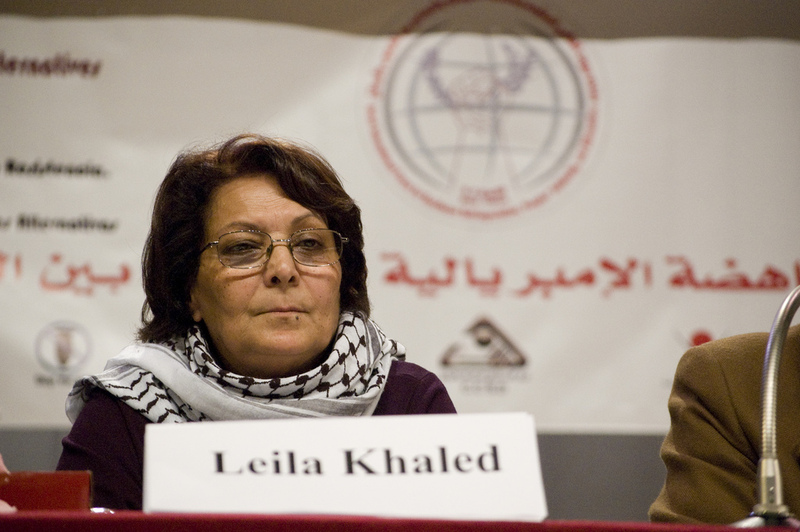 Comrade Leila was the subject of a film entitled Leila Khaled, Hijacker. The documentary film Hijacker – The Life of Leila Khaled was directed by Palestinian filmmaker, Lina Makboul. Laila Khaled will always be remembered as a freedom fighter who stood up against the oppression of her country’s people. She fought against Israel and imperialism and for the liberation of Palestine. 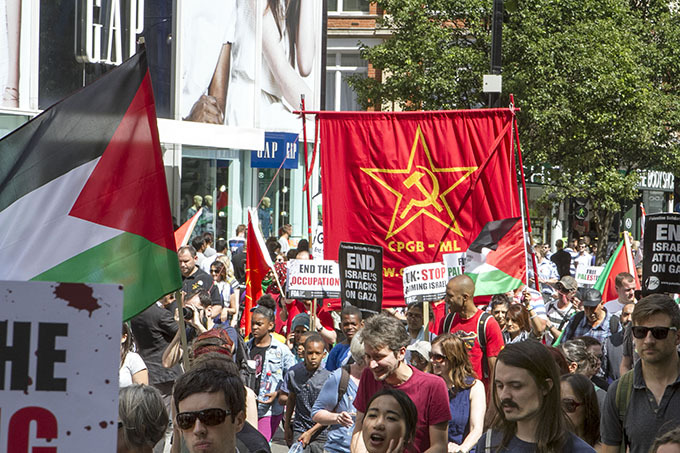 Communists, anti-imperialists and Palestinian activists today called for a cultural boycott of Israeli artists in Birmingham.